Stuart Yoshida has teachers and musicians as guests in each episode. Often from different parts of the world, guests have an informal chat about their ukulele activities. This is an enjoyable discussion to eavesdrop on even if you are a beginner player. Aldrine Guerrero and his guests/co-hosts answer student questions from Thursday live lessons. Aldrine also hosts a Friday live jam on YouTube. Viewers can play along and post comments during the broadcast. A great way to learn and connect with ukulele lovers in other parts of the world. In his one-man podcast, Abe Deshotel shares his favourite things and interviews his favourite musicians and teachers. Abe is a recording musician and teacher. Full of ukespiration, Abe’s love for and devotion to the ukulele is infectious. Meredith is based in Canberra, Australia and interviews a ukulele player in each episode. Meredith’s love for ukulele, community created around it and the happiness it brings is apparent. She also has a cool theme song! 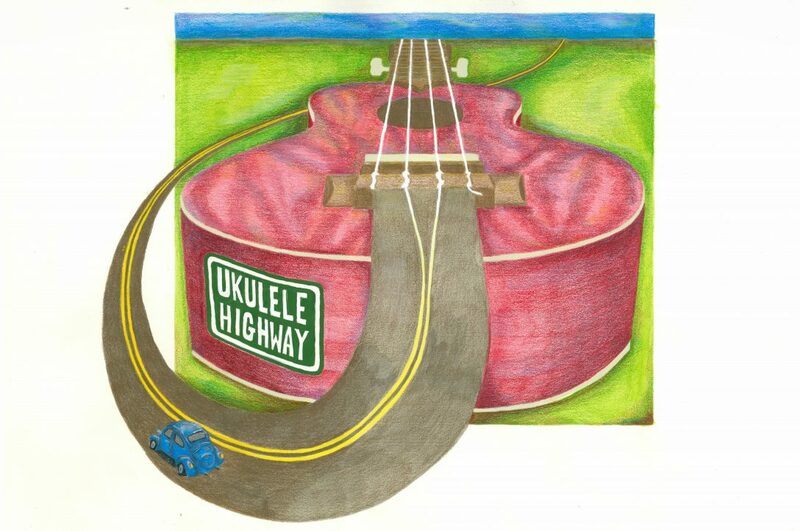 I like listening to podcasts while rambling along the Ukulele Highway. Do you have a favourite ukulele podcast that isn’t in this short list?